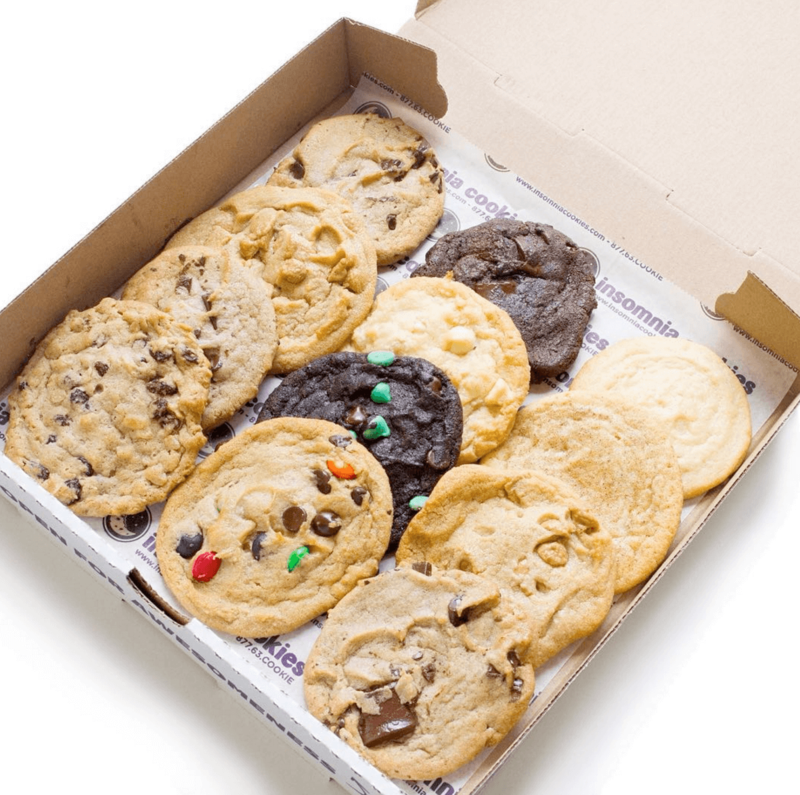 What They Say: Insomnia Cookies was founded in a college dorm room in 2003 at the University of Pennsylvania, by then student, Seth Berkowitz and they have been feeding the insatiable hunger of their fans ever since. What makes us them great? 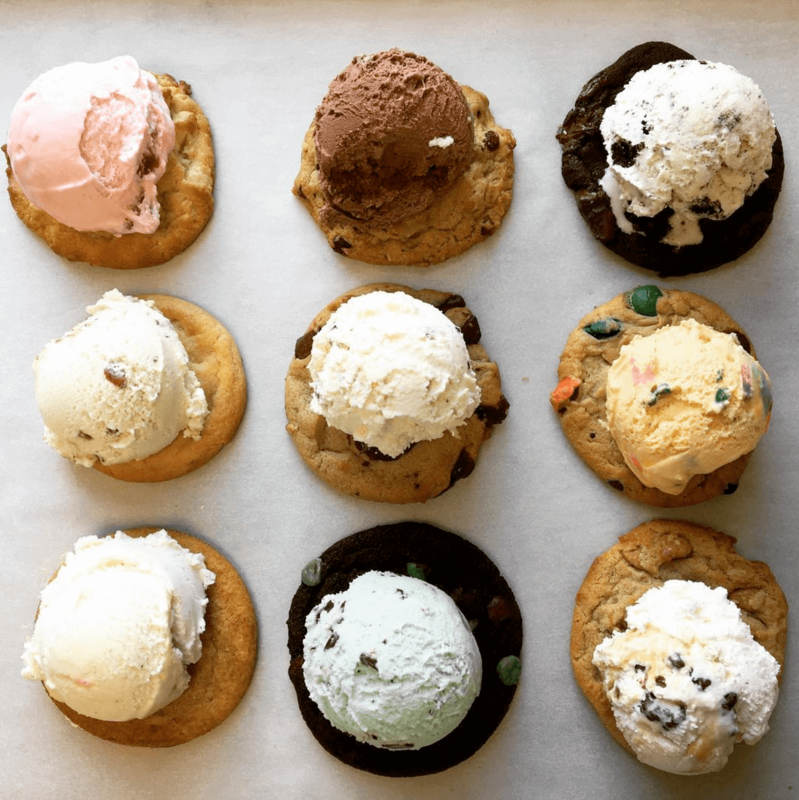 They specialise in delivering warm, delicious cookies right to the doors of individuals and companies alike, and they also make the best ice cream cookie sandwiches, until 3am every day. We’re listening. 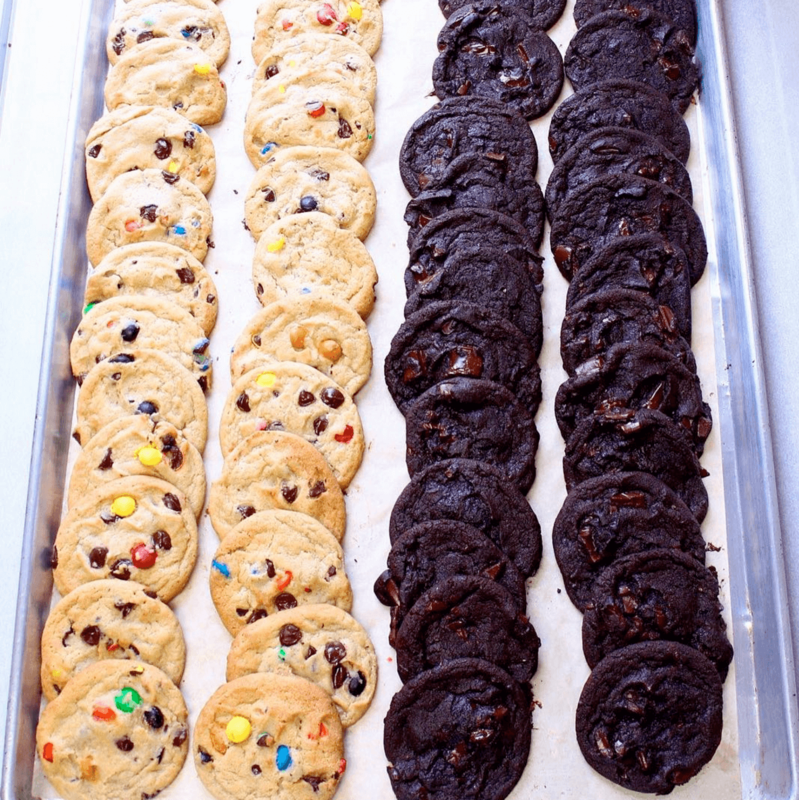 What We Say: Oh baby, these cookies. Just how you want them: soft, chewy, melty in the middle, these are the American cookies of dreams. Forget Ben’s Cookies, it’s all about Insomnia. We might have them three days running – I have no regrets. Our favourites ones were the Peanut Butter Chip (a little taste of heaven, right there), the Deluxe Chocolate Peanut Butter Cup (seeing a theme here?) and the Deluxe S’mores Cookies, which are so ridiculously decadent and delicious. If you want to go all out, get them with a scoop of vanilla ice cream and a sprinkle of crumbled Snickers. Heaven. What They Say: Think creative gourmet burgers, delicious sides, over-the-top shakes and draft beers – all served in a small, casually hip diner, and you’ve got Black Tap down. 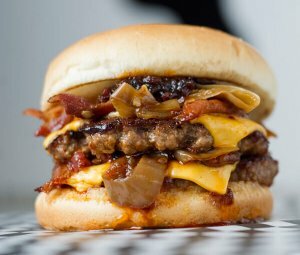 As well as serving up some amazing burgers, such as The All-American with lettuce, tomato, pickles, american cheese and special sauce, and The Old Fashioned burger with crimini mushrooms, swiss, caramelised onions and horseradish sauce. They also do killer salads; try the Kobe Burger Salad, which comes with Wagyu beef burger, bacon, blue cheese, tomato and scallion. Although the food is awesome, milkshakes are really what bring all the boys to the yard here. 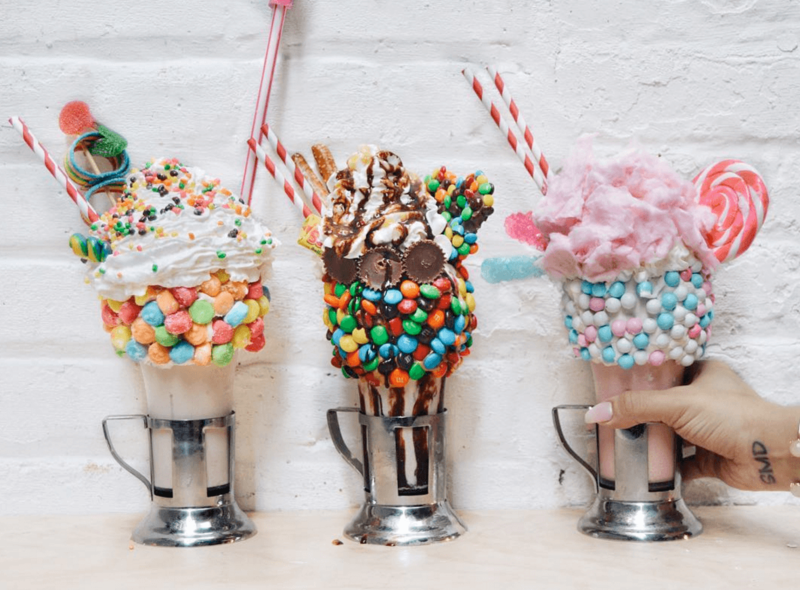 What We Say: These freakshakes need to be seen (and tasted) to be believed. Truly, you’ve never tried anything as American in your whole life – totally over the top, decadent, crazy and indulgent, there’s such a one-off on New York experience, I demand you try one. We loved the Cookie Milkshake, a twist on cookies and cream that features tons of vanilla frosting, ribbons of chocolate syrup and an entire chocolate chip cookie ice cream sandwich. But the ultimate had to the be Sweet N’ Salty Shake with peanut butter and chocolate – it’s the most rich, chocolatey thing you’ve ever tried. 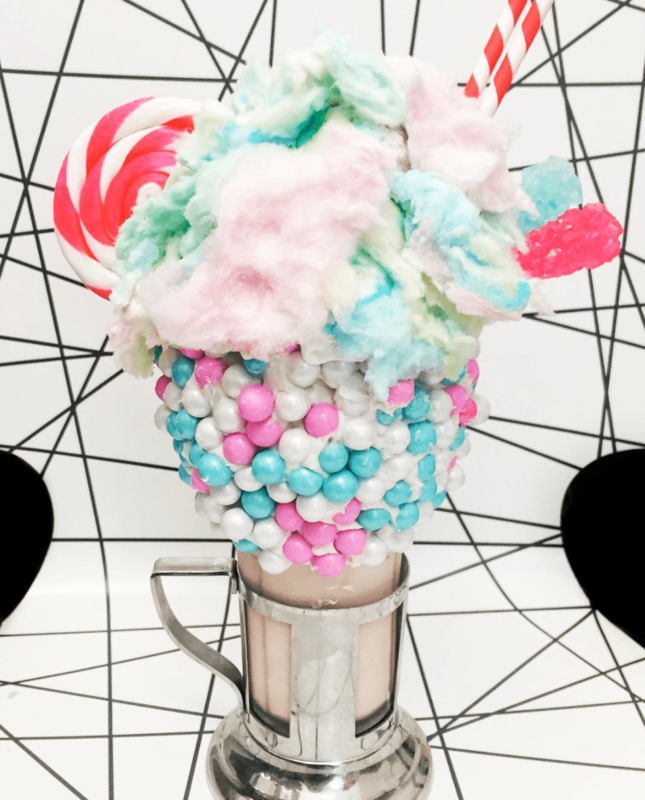 For something girly and fun, try the Sour Power Shake, which comes with vanilla frosting and candy-coated chocolate pearls, topped with whipped cream and cotton candy! Be prepared to queue for a long, long time (it’s worth it). What They Say: Max Brenner is a household name for a reason. A worldwide chocolate restaurant (yes, you read that right, chocolate restaurant) and retail brand headquartered in New York, with more than 50 locations, they’re doing something right. They take chocolate to a new level; they ‘free’ chocolate from its cage, so you can enjoy it new, unusual ways. Every little detail has gone into the creation of the chocolate experience, from their Hug Mugs – a mug is shaped to be hugged in both hands to create the ultimate drinking experience of coziness, warmth and fragrance – to the DIY desserts, it’s the kind of place where you inner child comes to life. What We Say: Oh sweet baby Jesus. 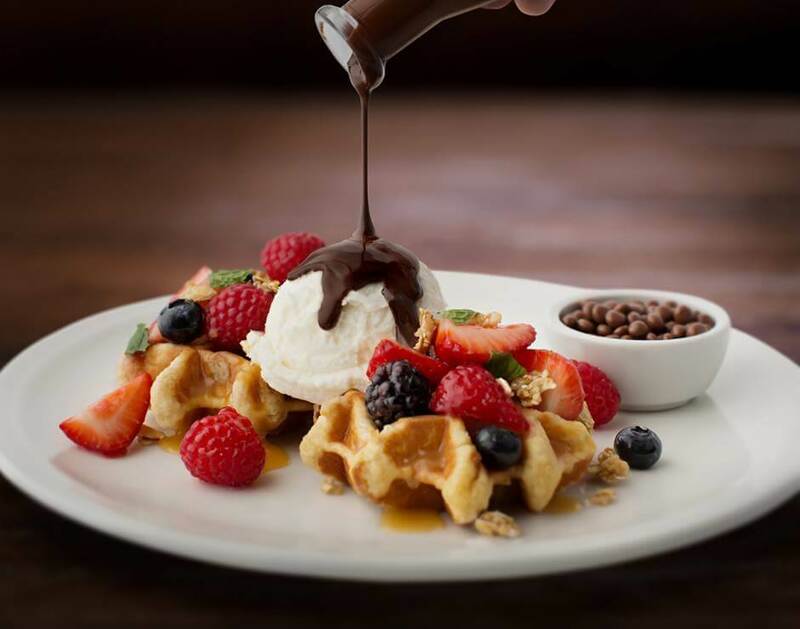 The menu at Max Brenner is like nothing you’re ever experience before – it’s a total chocolate-lovers dream. I mean, everything here is irresistable. You can have thick, Italian hot chocolate with vanilla cream in a choice of milk, dark of white chocolate, with unusual flavours such as peanut butter, Mexican chilli, cinnamon or hazelnut hot chocolate. 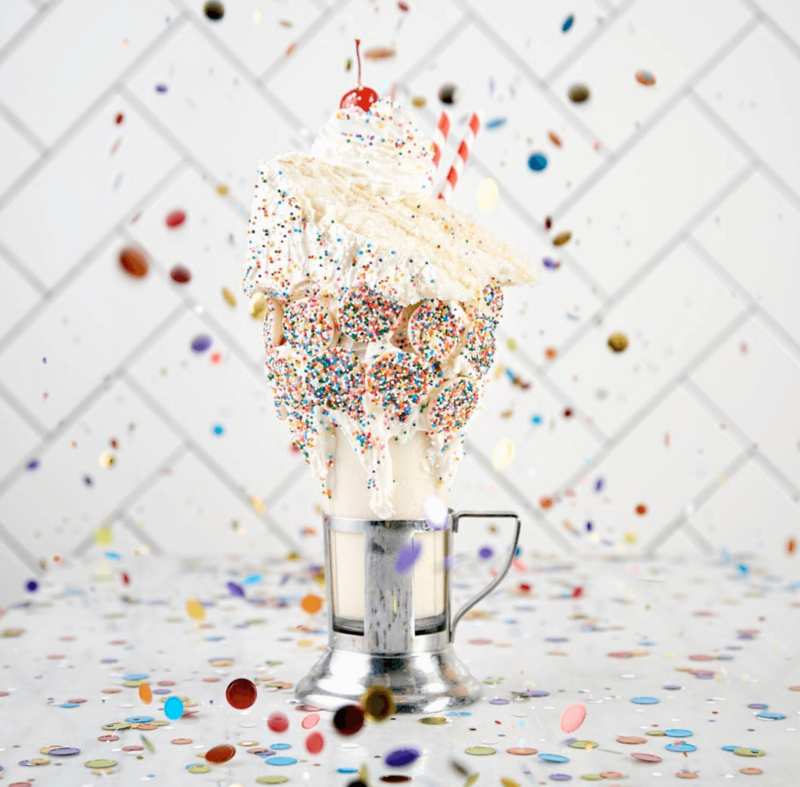 There’s also incredible milkshake, such as 80’s Milkshake with milk chocolate ganache, vanilla ice cream and a crunchy chocolate shell, or Peanut Butter Turtle Choctail, with dark chocolate ganache, peanut butter, caramel and whipped cream. And the crepes. Oh boy, the crepes. You NEED to try the Banana Hazelnut Crepe with chocolate hazelnut spread, sliced bananas, chocolate chunks and chopped hazelnuts and the S’mores Crepe with crunchy graham crackers, milk chocolate chunks, hazelnut spread, peanut butter and marshmallow fluff, they are all divine. And there’s more, of course. 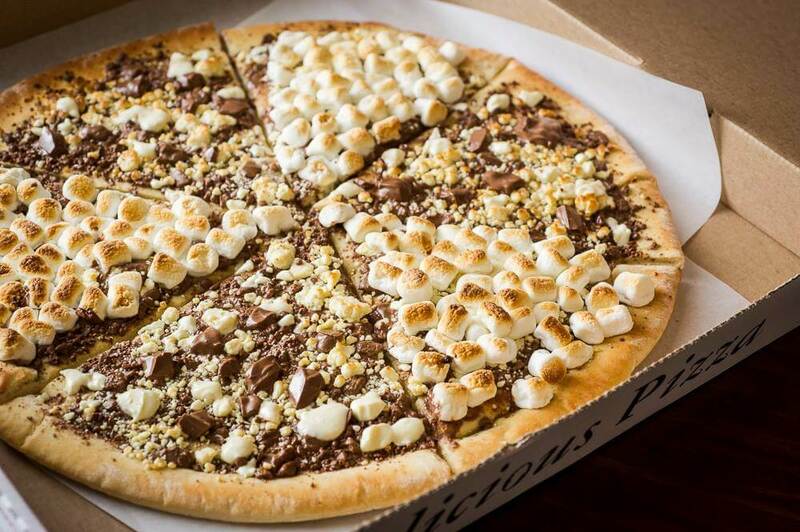 The Melting Chocolate True Heart Cake and Shake – a milk and white chocolate heart cake served with creamy vanilla ice cream, red berries and an iced milk chocolate shot – or the Chocolate Chunks Pizza Max’s with melted milk chocolate. There’s even chocolate pasta – Chocolate Crêpe “Pasta”* with ribbons of dark chocolate crepes topped with melted milk chocolate, vanilla ice cream, caramelized hazelnut bits and Choco-pops. You get the point. Just. Go. 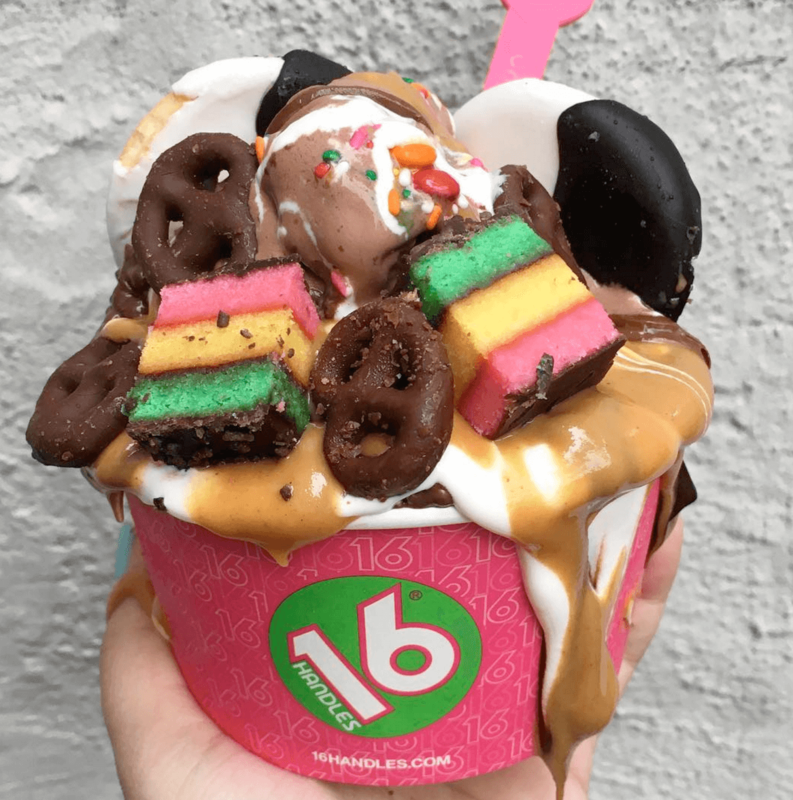 What They Say: 16 Handles, New York City’s #1 frozen yogurt and dessert brand, celebrates your individuality; with endless combinations of frozen yogurts and toppings, they encourage everyone to flaunt their flavour. 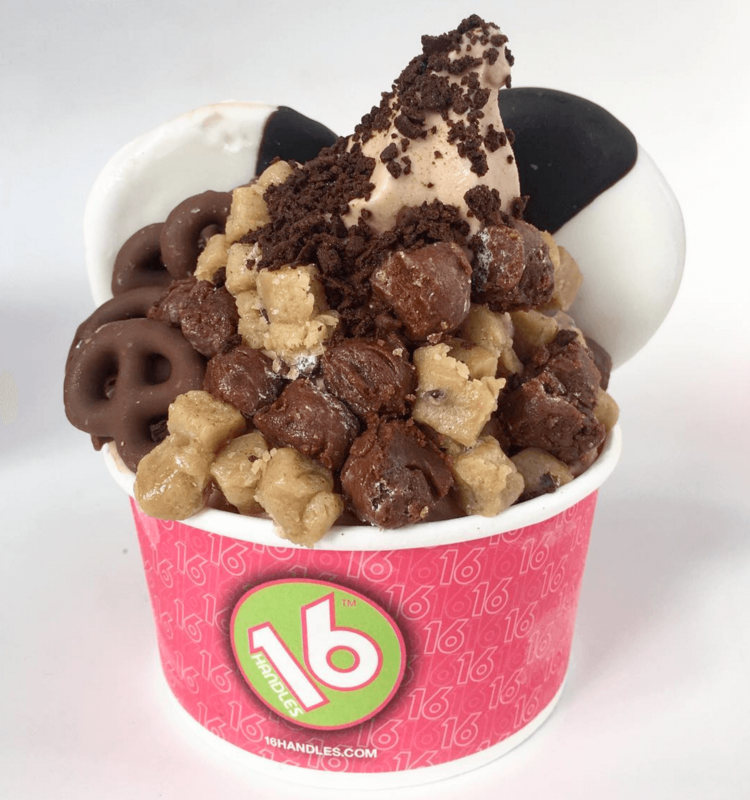 16 Handles is committed to serving fresh, quality, better-for-you options that allow you to unleash your inner chef. Create what you want and savour it your way – with no combination too crazy. This is the place that started a frozen yogurt revolution. What We Say: A visit to 16 Handles is totally mandatory when in New York. With the most incredible array of frozen yogurt flavours and crazy toppings, there’s nothing more fun than creating your own wicked frozen yogurt here. My personal favourite flavours are Peanut Butter Obsession, Pecan Praline and Pistachio, but you’ll be totally spoilt for choice here. They have every yogurt flavour you could imagine, including American Apple Pie, Coconut Custard Pie, Fudge Brownie, Pumpkin Pie, Salted Chocolate Chip Cookie Dough and Red Velvet flavour! There’s also some incredible toppings to customise your yogurt, such as Mars, Snickers, melted chocolate, Graham Crackers, Haribo, fresh fruit, nuts, granola and so much more. You get the point: it’s amazing, just go. 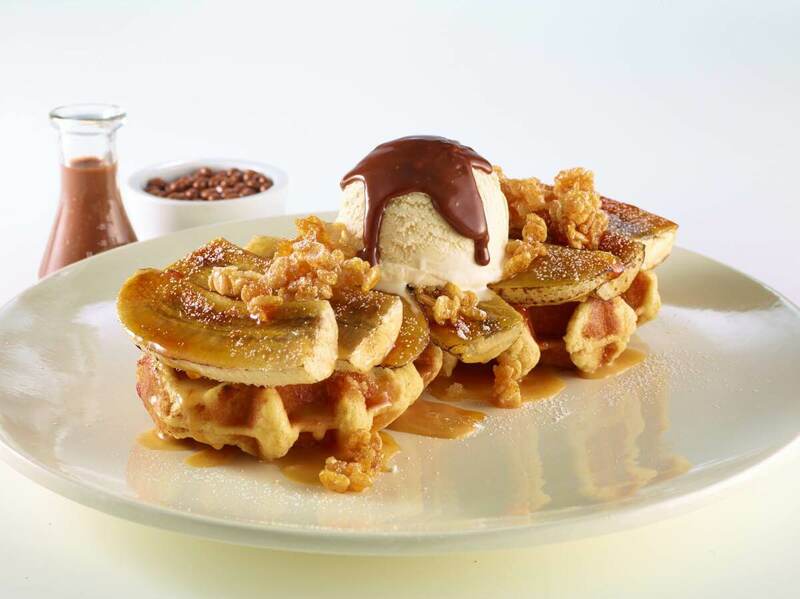 What They Say: Spot is a dessert bar like no other, home to a whole new world of delicious flavours and tastes. 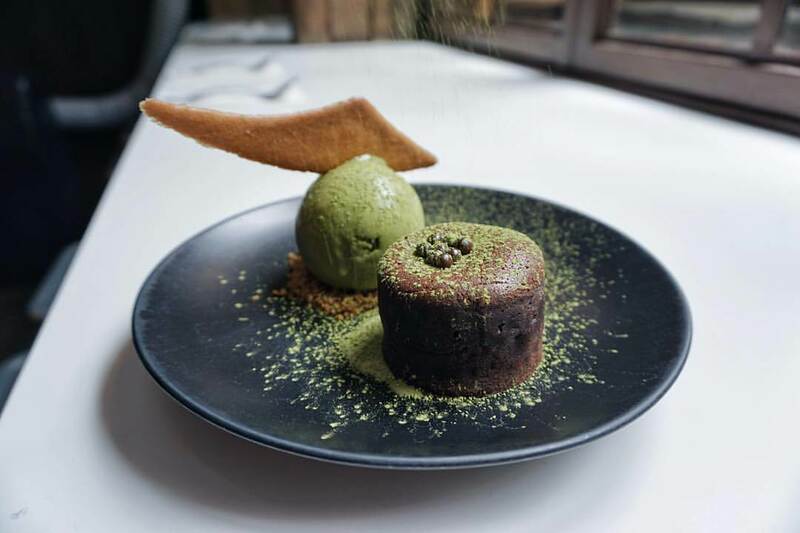 At Spot, traditional confections are re-imagined and spiked with healthy dose of Asian Flare; there’s a ‘tapas’ list of desserts to choose from (3 tapas for $27), and you can mix and match your favourite desserts to get a taste of everything. Forget main courses, this is foodie heaven right here. Grab your friends, this is one place you need to try. What We Say: Oh. My. God. 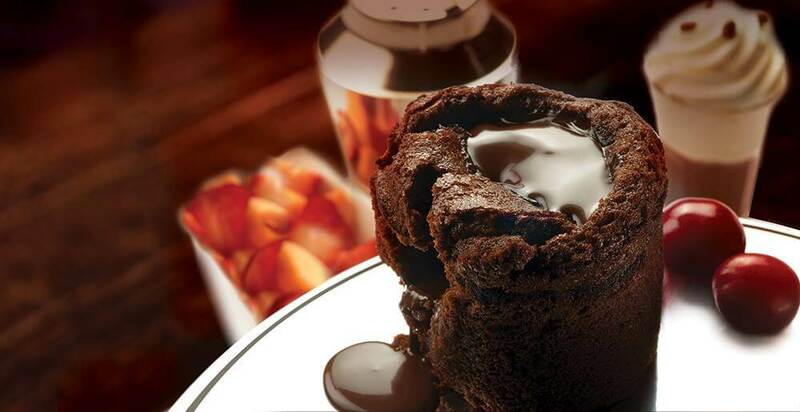 This is a dessert-lovers heaven, right here. Thanks to unique ingredients like Green Tea, Kobacha, Yuzu and more, the desserts here are anything but ordinary. Their desserts pack innovative flavours and unexpected benefits into every bite. Truly one of a kind. The Seasonal Dessert Tapas is just so much fun; we loved the Golden Toast, crispy honey buttered toast, fresh strawberries, whipped cream and condensed milk ice cream, and the Coconut Monkeybread (which also happens to be vegan and gluten-free) with brown sugar syrup, coconut crumble and coconut ice cream with basil seeds. 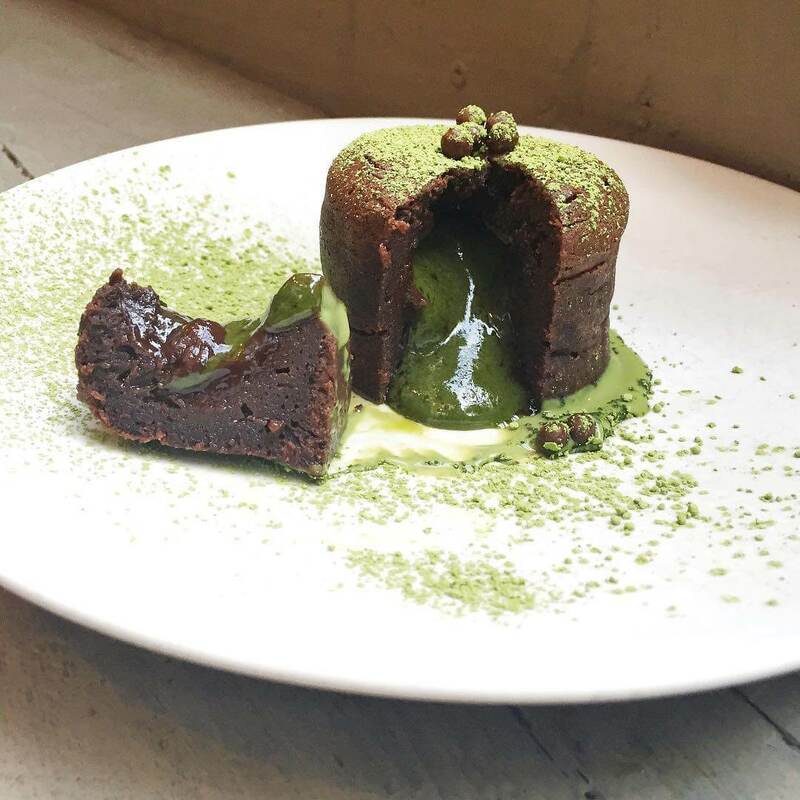 Of course, you can’t miss their iconic chocolate lava cake – an oozing middle, filled with the flavour of matcha and served with matcha ice cream, it’s truly a taste of pure heaven. I’m putting it another photo. Because just LOOK at it. At Ribalta, the classic Neapolitan Italian restaurant in New York’s Greenwich Village, they serve one of the best tiramisus in the city. Please see needed information outlined below, as well as an image attached, and let me know if you need anything else. What They Say: Halva Fluff is a signature dessert at the modern Israeli digs Green Fig, a newly-opened restaurant which showcases the unique and exotic flavours of Modern Israeli cooking. The restaurant is a place where the influences of North Africa, the Middle East and the Mediterranean mix in often surprising, yes always delicious, ways. The chef behind Green Fig is Gabriel Israel, a dynamic young talent who grew up in his family’s restaurant business in Tel Aviv and went on to cook at Boulud Sud (where the staff gave him the nickname “Shuka” for the delicious shakshuka that he would prepare). His rave reviews led him to co-found the popular Shuka Truck, which specialised in creative takes on the Israeli breakfast staple. Gabriel is also a graffiti and tattoo artist, his art often serving as inspiration for the colour palette and plating of his dishes. We love. What We Say: You NEED to try this pudding. 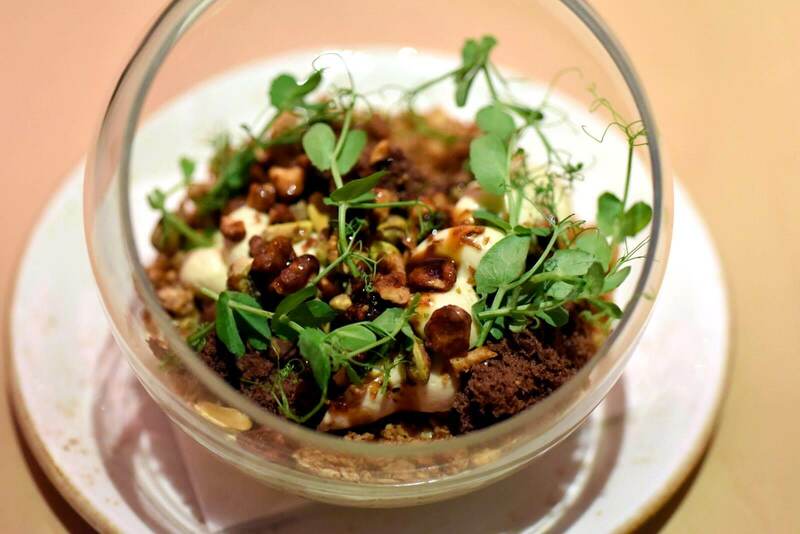 A whimsical dessert that resembles an edible garden, presented in a tilted glass bowl, with pieces of halva and airy sponge cake that look like rocks, granola “soil,” microgreens, baked honey and pistachios – it’s more like a work of art than a dessert. 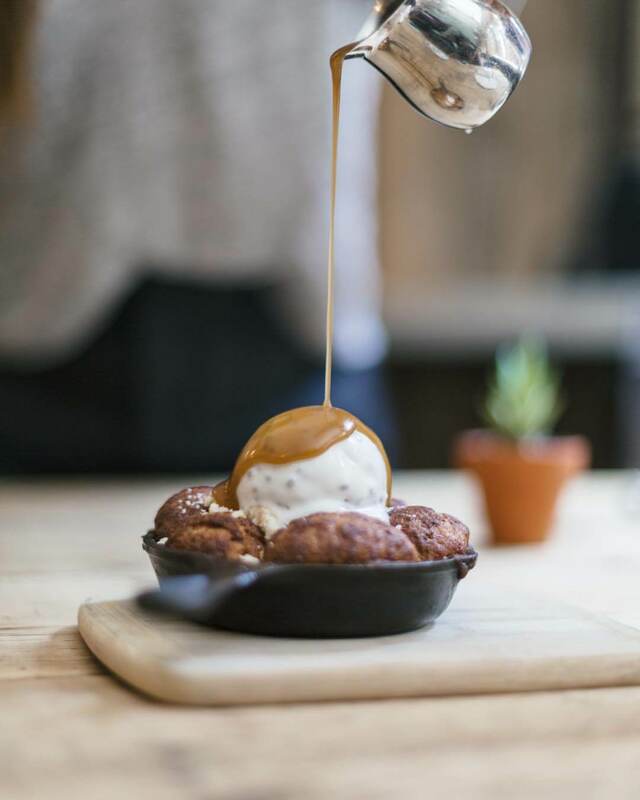 The dessert also happens to be totally delicious, as well as fully Instagrammable, and it’s definitely something to add to your NYC bucket list. 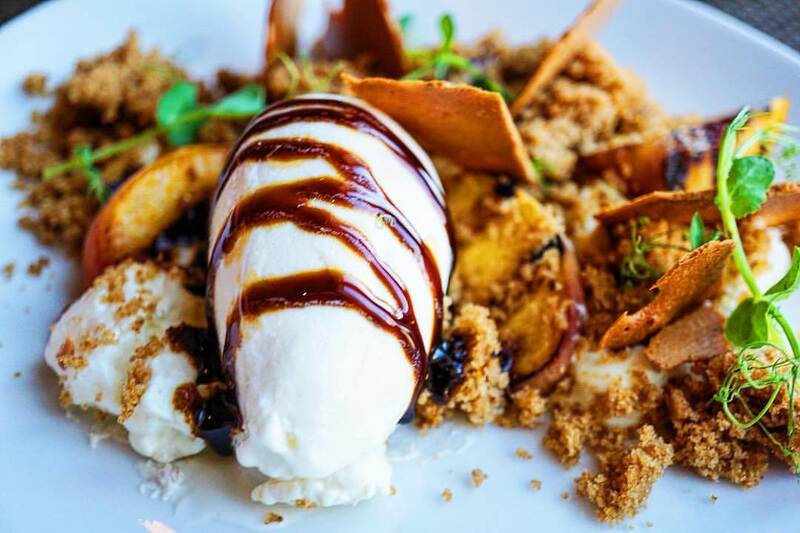 Also try the Peaches and Cream – grilled peaches, coconut anglaise, almond tuile, pomegranate mousse, vanilla ice cream and their Chocolate Mousse with salted caramel fluff, fresh figs, orange tuile, they are both delicious. You’ll love the vibe of Green Fig – it’s cool, laid-back and the Middle Eastern-inspired food is top notch. One you can’t miss. What They Say: Union Fare is a new industrial restaurant and gastrohall in Union Square, that prides itself on contemporary American cuisine, curated by Executive Chef Yvan Lemoine. 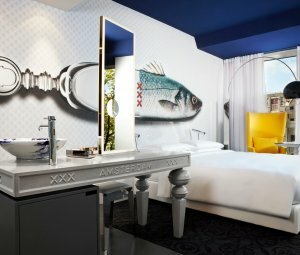 Their menu features everything from East Coasts oysters and lobster cocktails to house-made fusilli, roast chicken and Ahi tuna melt. One of their most popular desserts is the Chocolate Luge – a tower of Devil’s Food Cake with chocolate mousse and caramel – and the real beauty of the dessert comes together right at the table when guests see chocolate sauce poured down the constructed luge of thin carved chocolate. Yes, please. 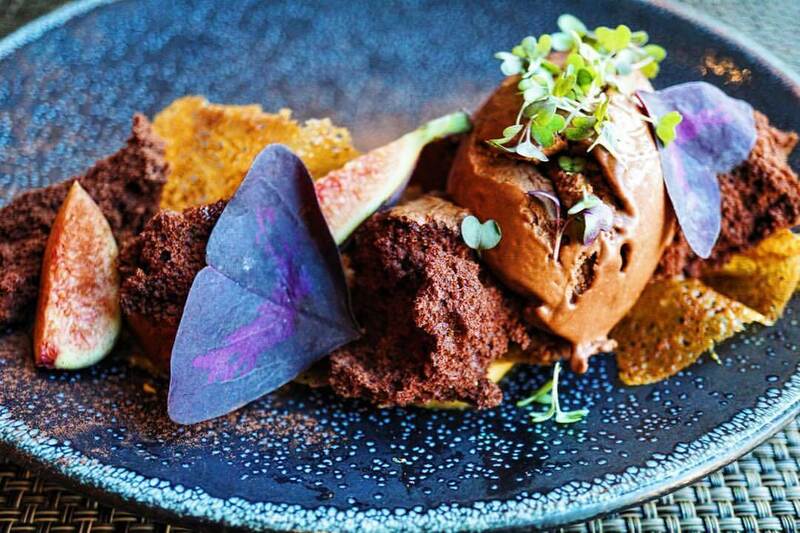 What We Say: The desserts at Union Fare are next level. 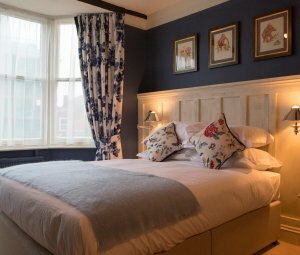 As well as being delicious, they engage diners on a sensory level – maintaining the perfect balance of refinement and unpretentiousness, with thoughtful construction. 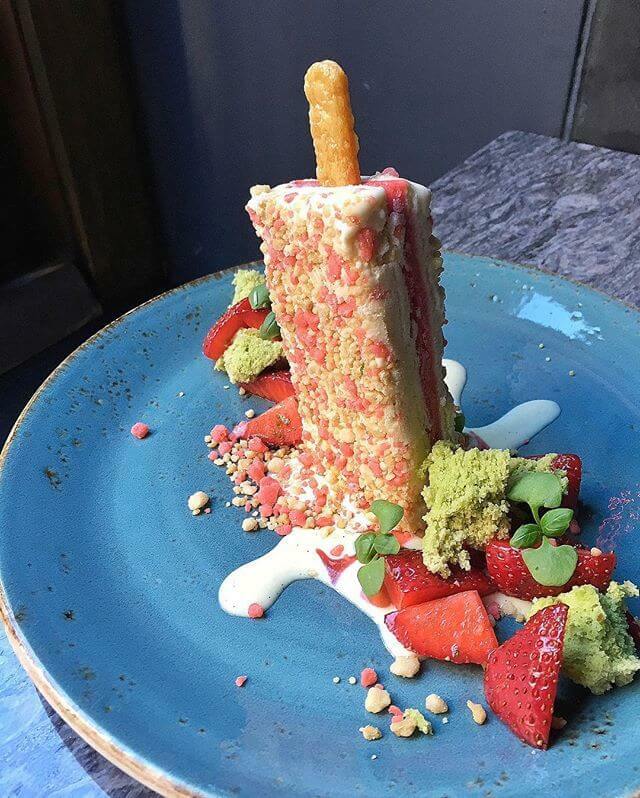 Nothing short of a delicious miracle, Union Fare’s Strawberry Creamsicle is comprised of vanilla ice cream with strawberry sorbet and shortcake streusel, and sits atop fresh strawberries, basil sponge cake, and micro basil. It’s like all your childhood memories rolled into one, and we totally loved it. If you’re an exotic fruit lover, try their passion fruit creation. Union Fare’s Passion Fruit Dessert mimics the look of a real halved passion fruit, filled with coconut sorbet, topped with passion fruit seeds, and surrounded by Tres Leches cake pieces and chocolate branch garnishes. Glorious. What to Order: Various ice cream flavours, with a choice of toppings, including olive oil and sea salt, key lime curd, ginger syrup, elderflower and wasabi pea dust. What They Say: Throughout their years living in New York City, Douglas Quint and Bryan Petroff had always focused on their respective careers – until they got themselves a Big Gay Ice Cream Truck. Their seasonal truck debuted in June 2009, and since then, the business has seen a whirlwind of publicity and has become a New York favourite. With a playful attitude, Big Gay Ice Cream spins a new take on old-school soft-serve by creating fun and unique ice creams, toppings, and frozen treats that appeal to a diverse mix of clientele. 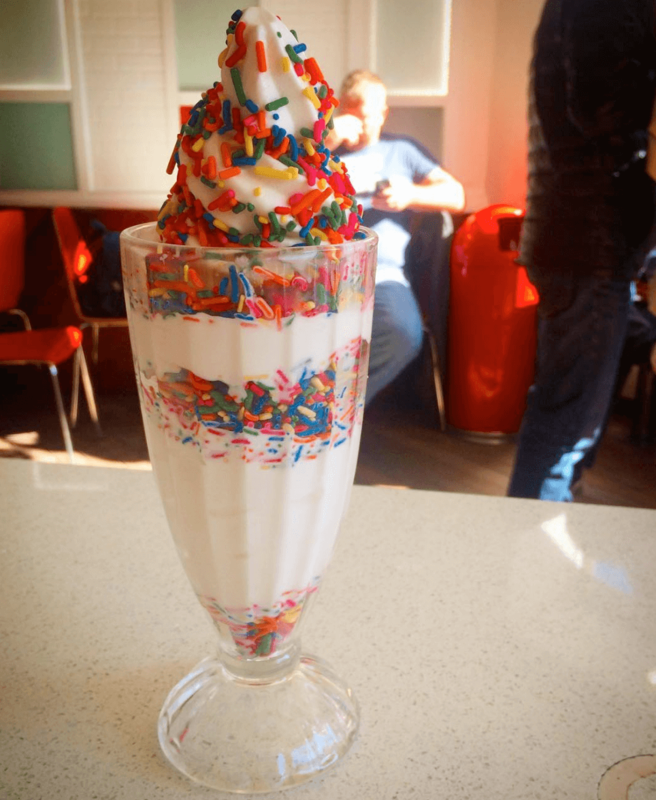 What We Say: We love somewhere that doesn’t take itself too seriously, and Big Gay Ice Cream is just that. 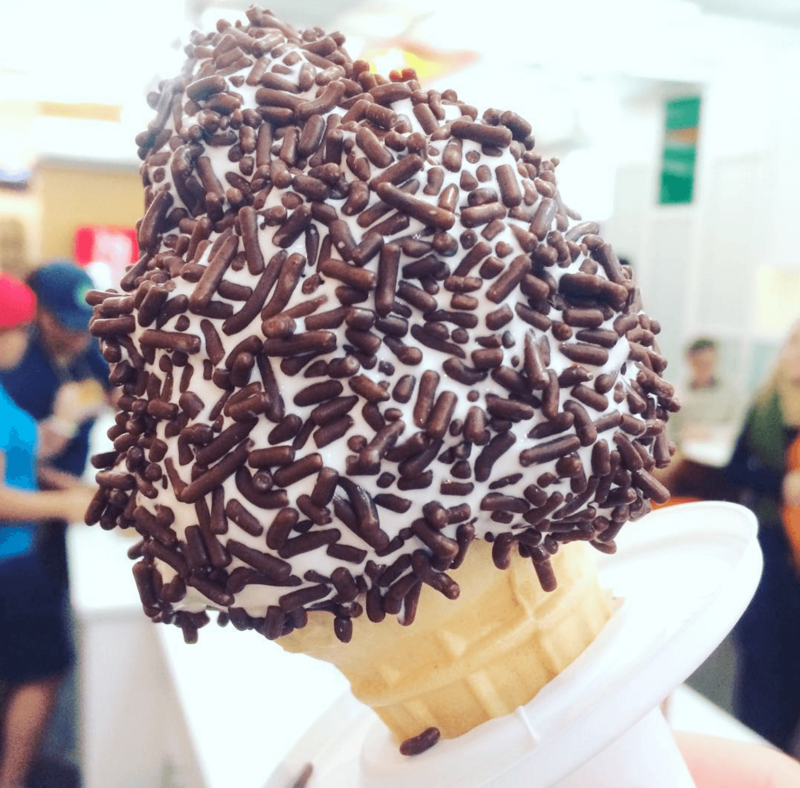 A delicious ice cream parlour with a sense of fun and playfulness at its core, the ice cream here is top notch and is guaranteed to put a smile on your face. Get the vanilla ice cream with Dulce de Leche toppings – too good. What They Say: Doughnut Plant is the pioneer gourmet doughnut purveyor, making deliciously original doughnuts for all the enjoy. They only use the best quality ingredients in the doughnuts; all natural, highest quality ingredients, made fresh daily with their own jam fillings, and organic when possible. What’s more, in 2010, they started pressing our own juices and milks. They use the Norwalk method which makes the most nutritionally complete juice, containing 3-5 times more vitamins and minerals than juices extracted any other way. Hashtag balance. 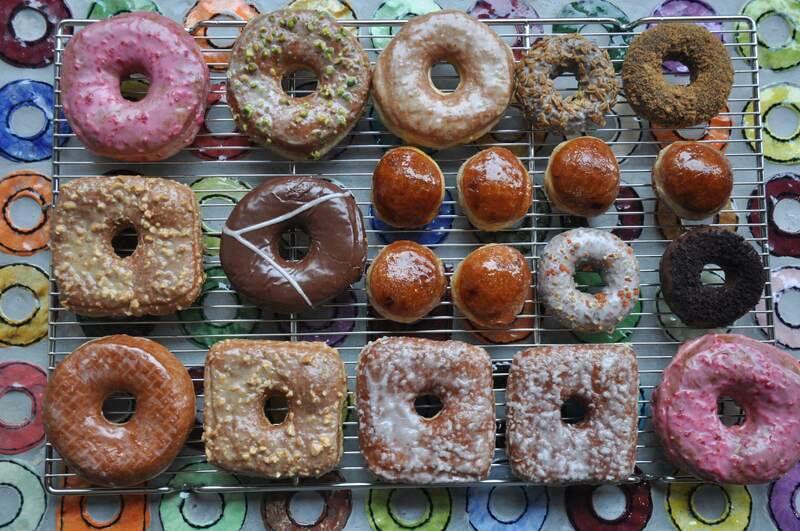 What We Say: Doughnuts like none other. 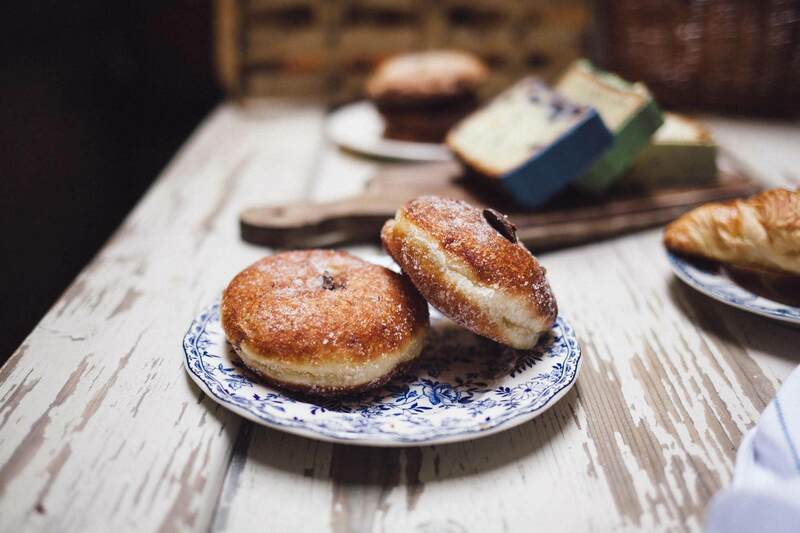 They offer an amazing array of doughnuts at Doughnut Plant, including some really unusual ones which we totally loved. 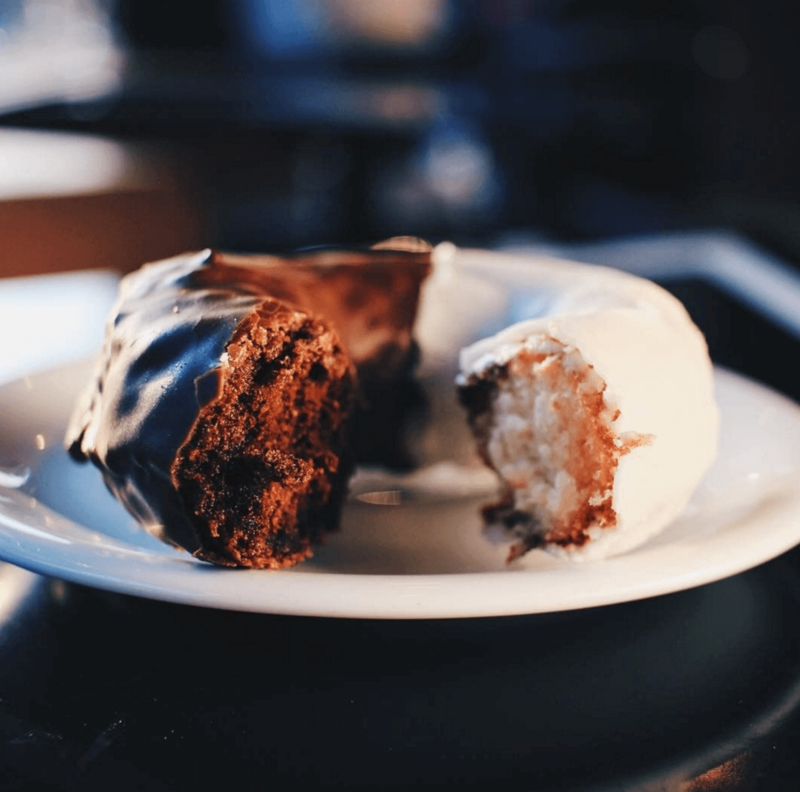 You can’t miss the filled doughnuts, for something special, as well as their cake doughnuts – cake doughnuts have a texture somewhere near the intersection of a classic birthday cake and a buttery pound cake. The Carrot Cake filled doughnuts needs to be tried – a traditional carrot cake with lots of real carrots, raisins, walnuts and spices, with a cream cheese filling. Glorious. They often have seasonal specials – at the moment, they are Apple Cinnamon and Original Pumpkin flavour – as well as a new 100% vegan doughnut. For something totally quirky and amazing, try the Doughpops – savoury yeast filled doughnuts, which come in vegetable cream cheese and avocado salsa flavour. Avocado doughnuts? Go on, then. What They Say: Rosario and Pasquale have brought Naples into the heart of New York to make you experience a one-of-a-kind taste: to taste the true Neapolitan pizza. At Ribalta the ingredients are all the Neapolitan ones: from the flour used for the dough, to natural yeast, to tomatoes, to Buffalo-milk mozzarella from Campania. Customers can also ask for customised pizzas, even putting together the ingredients of their own pizza. 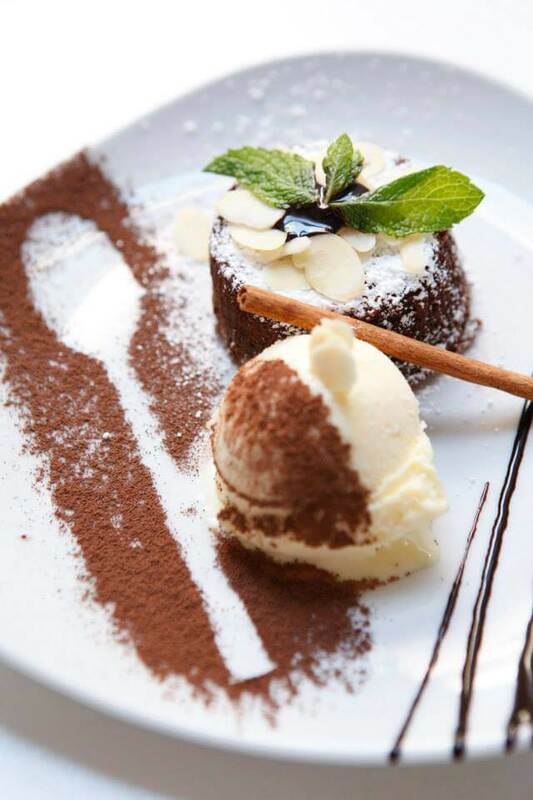 What’s more, they have a cracking dessert menu; from Tiramisu to Fresh Frutti Di Bosco and Caprese, the traditional Italian desserts are the pride and joy of the restaurant. 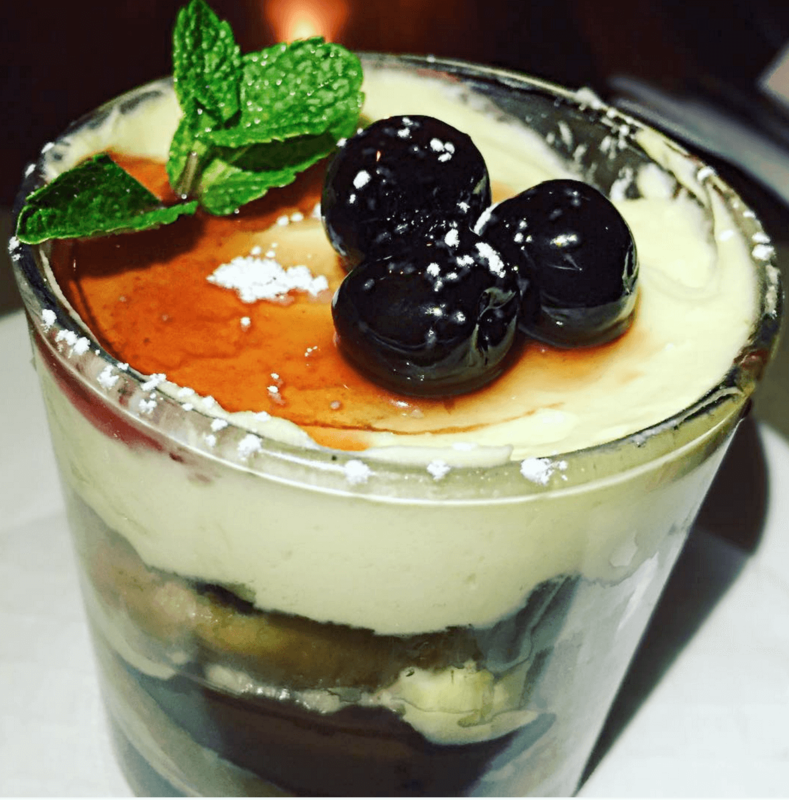 What We Say: Ribalta uses a traditional Neapolitan recipe for their Tiramisu (one of the favourite Italian desserts among New Yorkers) for something really rather magical. Nothing too fancy – this Italian classic features layers of ladyfingers dipped in espresso, topped with rum and mascarpone cheese. One of the best Tiramisu we’ve ever tasted. You can really taste the quality in the food and desserts here, from the fresh cheese to the fresh fruit, it all tastes so good. They also do a Babamisú – Neapolitan sponge cake layered with mascarpone and Nutella. Go get it. 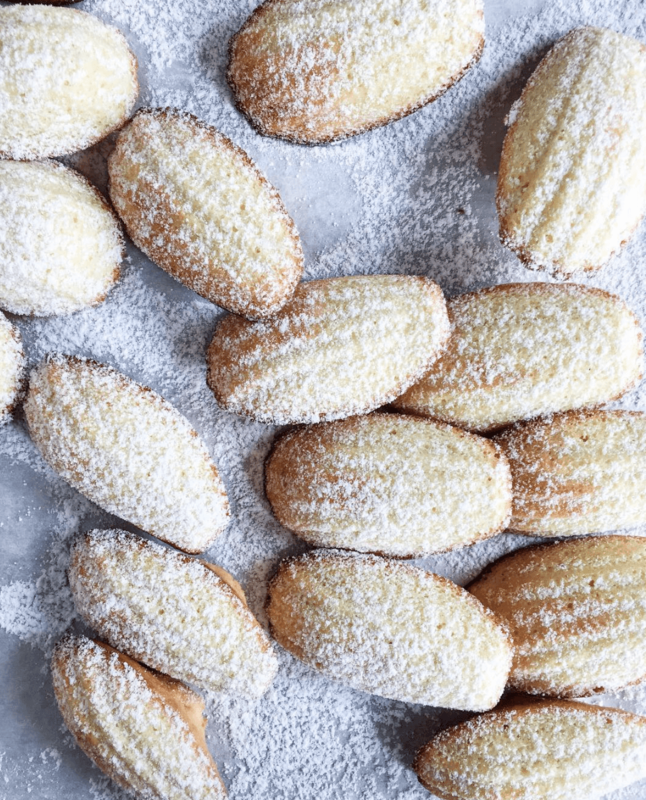 What They Say: Maman serves family-inspired recipes from the south of France and North America, bringing to life both savoury and sweet childhood favourites, including a selection of delicious baked goods made fresh daily! From their ‘famous’ nutty chocolate chip cookies to their homemade oreos and matcha croissants, it’s the kind of place where you can feel right at home again. Maman is a combined vision from three founders’ – Armand Arnal, head chef at Michelin star restaurant, la Chassagnette in the south of France, Benjamin Sormonte, entrepreneur and restaurateur and Elisa Marshall, entrepreneur, event planner, and designer – mutual passion for delivering exceptional food within an artful and warm setting. What We Say: The Nutella beignets are out of this world! The pastry dough is super soft and moist and has the perfect amount of Nutella inside, and the sprinkled sugar on top adds the perfect touch. 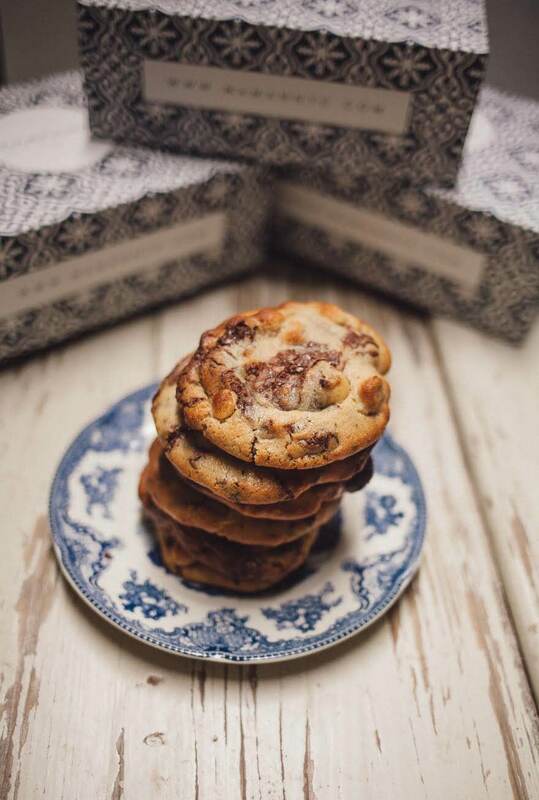 Also the ‘famous’ nutty chocolate chip cookies are some of the best we’ve ever had. They are moist and chewy on the inside and crisp at the edges, with deep notes of nutty saltiness to balance its sweetness. 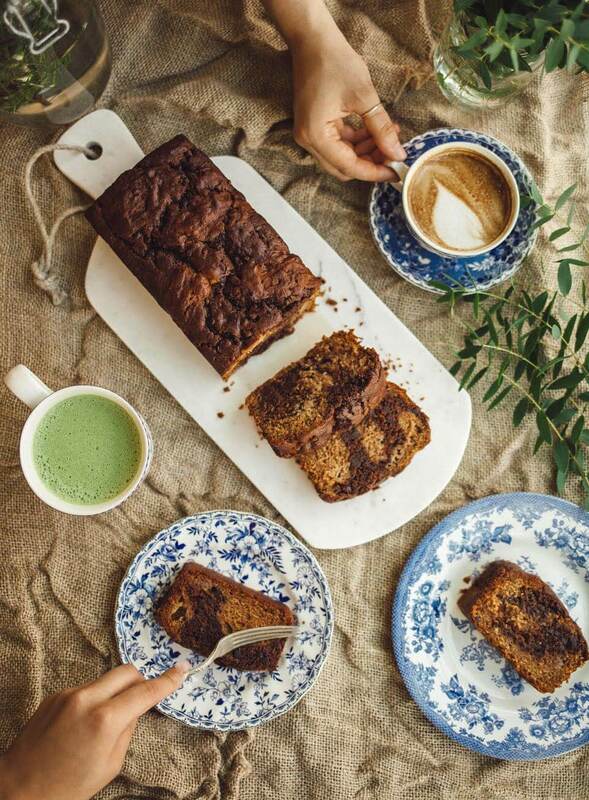 They also have an amazing gluten-free banana chocolate marble teacake on the menu, which is a collaboration with pastry chef Erin McKenna. It’s packed with ripe bananas and agave for a perfectly balanced sweetness and garbanzo and fava bean flour for a soft yet slightly dense crumb. 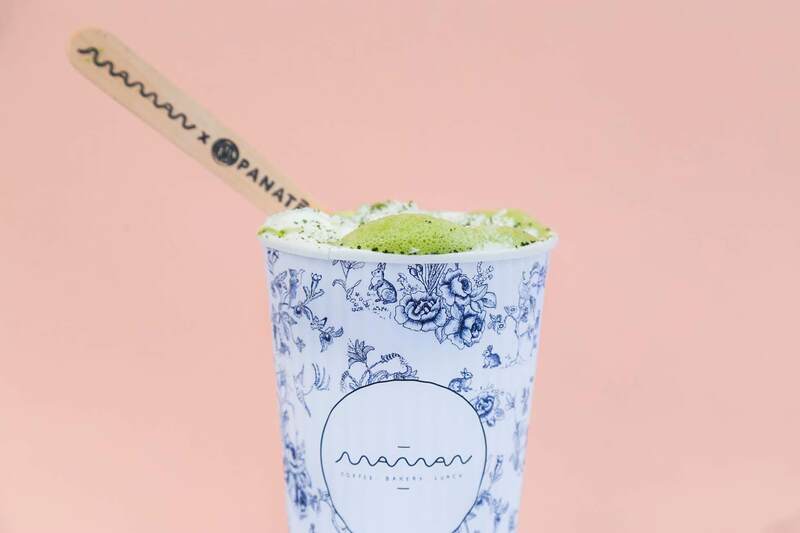 To wash all of it down, the bakery has teammed up with PANATEA to create the BEST matcha drink of the holiday season – a PANATEA Matcha White Hot Coco, which will be available at all Maman NYC locations starting November 1st. Think PANATEA matcha, Guittard melted white chocolate, and almond milk with the option to top it off with whipped cream and fresh coconut flakes. Where: Tribeca – 211 west broadway, tribeca nyc (at franklin st.). All locations here. What They Say: Bread Alone is a family-owned, values-driven bakery, who have been baking using organic grains since 1983. Their vision has not changed since the day that they opened: to create delicious, honest breads and foods that speak to the best in us. 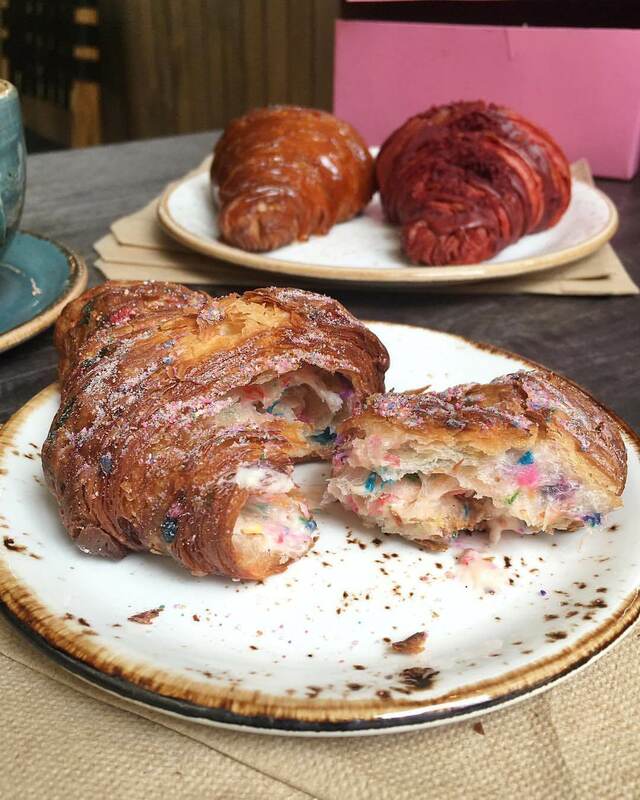 Their pastries are inspired by traditions from both America and Europe; they strive to make, delicious, deeply satisfying items for treats and for every day. What’s more, all of their pastries feature ingredients from their Hudson Valley partners, so you can be sure of the quality. 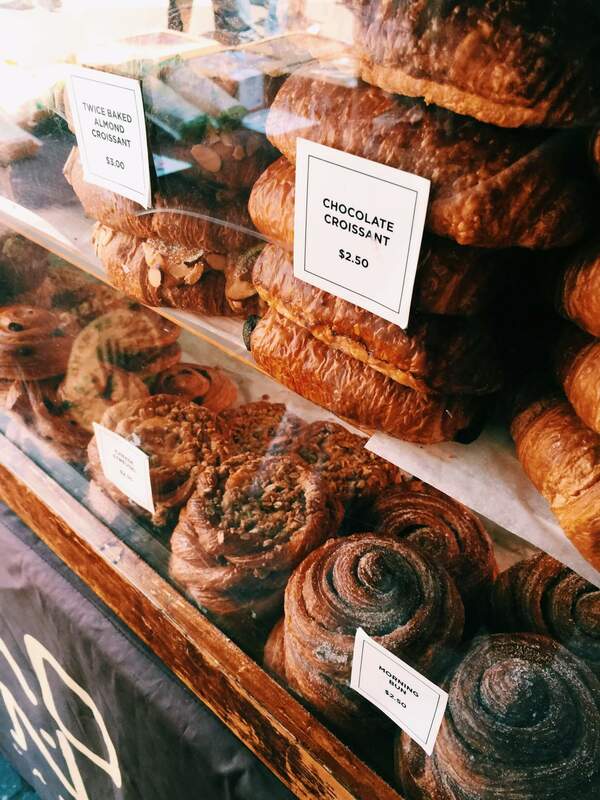 What We Say: The best pastries in all of NYC. You NEED to try their twice-baked almond croissant, it’s too delicious for words, and the Morning Bun – that’s seriously good too. 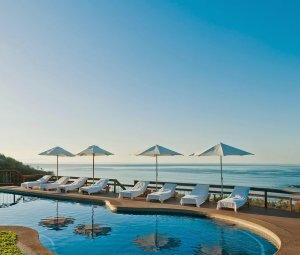 Other highlights include their pecan sticky bun, apple tart and amazing selection of scones – the chocolate walnut scone is an absolute delight, as is the savoury feta and herb scone. For a beautiful loaf to take away, try the organic whole wheat sourdough or the amazing olive bread, which is delicious as a base for homemade avocado on toast. Win. Where: Catch them here – Union Square Greenmarket is open year-round, 8am-6pm, on Monday, Wednesday, Friday and Saturday. La Compagnie operates twice daily flights from Paris CDG to New York from 700 euro return – see more here. For more information on New York, visit the official NYC Go website here.